From the crest of the Papagayo peninsula, we have a delightful view of the sunset dropping behind the puffy clouds and backlighting the wispy clouds, with the forest and ocean below. The clouds add to the sunset, in my opinion, compared to a cloudless sky. This week we are showing photos of the Music Palace in Barcelona on Viva la Voyage travel photo site. Sometimes when watching a sunset it pays to turn your back on the sunset and look towards the sky in the opposite direction. This is the scene of clouds in the Eastern sky catching the colors of the setting sun. With colors like this in the opposite direction of the sunset, you can be sure that the sunset is full of color, as I will show tomorrow. Before heading to an overlook to see the sunset into the ocean, we lingered around the lakes of the golf course a bit to enjoy the reflection of the color developing for the sunset. There are a few ultra-luxury homes being built on the shores of this small lake, with views overlooking the lake on one side and views on the other side overlooking the ocean. The sun dropped a little lower in the sky as Julie and I drove around to take some photos of the Papagayo peninsula. Here you see the sun peaking through the agave leaves next to one of the lakes on the golf course. When we see a sun and sky like this, we know that great Costa Rican Pacific sunset is coming up next. It is time to get to a spot where we can see the sun drop into the ocean. The late afternoon sun pierces the leaves to cast long shadows on the Papagayo Golf Course. Late afternoon is the best time to take photos of golf courses, as the colors are warmer and deeper. We have a friend who is a professional golf course photographer. He has photographed more than 500 golf courses around the world. The late afternoon sun means that sunset photos could be coming up in the near future. The Papagayo peninsula is so upscale that even the manhole covers are fancy, with a butterfly design. In fact, it is so upscale that it has underground utilities and manholes. Most of Costa Rica does not even have storm sewers and manholes in the streets. In fact, many towns have only a few paved roads. The Papagayo peninsula has streets made of paver bricks, underground utilities, and artistic manhole covers. Julie and I have a good friend who takes photos of manhole covers on his travels. He has photos of unusual manhole covers from around the world. I think this manhole is worthy of his collection. Today is Sunday, so we have new photos on our Viva la Voyage travel photo site. This week we are showing photos of some delightful details of the Music Palace in Barcelona. This is an aerial photo of the same beach area that I showed in my photos yesterday and the day before. The main lobby of the Four Seasons Resort is the large, curved building in the center of this photo, in the narrowest spot of the peninsula. In this photo you can see how the hotel guests have access to beaches on both sides of the peninsula, although both sides are protected from the waves of the open ocean. You can also see that even though this is the highest density area of buildings on the Papagayo peninsula, there are still lots of trees to provide habitat for wildlife. This week we have photos of the Villa Serbelloni in Bellagio, Italy, on the shores of Lake Como on our Viva la Voyage travel photo site. I took this photo from the same spot as yesterday's photo, but it shows the scene a little farther up the Papagayo peninsula, right next to the beach used by guests of the Four Seasons Resort. The coastline in this area is very scenic, although there are not as many beaches for swimming and surfing as around Tamarindo. Also, it is not possible to walk for long distances along the beach, which we like to do from our condos. You can see how steep the coast is here. This provides excellent habitat for monkeys, birds and other wildlife, as I will show you in a few days.. This week we are showing photos from the Villa Serbelloni, a retreat for scholars owned by the Rockefeller Foundation in Bellagio on the shores of Lake Como, Italy, on our Viva la Voyage travel photo site. This photo looks down on one of the two beaches at the Four Seasons Papagayo Resort. This beach faces the ocean, but it is in a cove so it is protected from the waves. The other beach is a short walk to the left of the scene in this photo, and it opens to a bay, so it does not have waves. In order to reach this hotel, if you are not a registered guest you have to call at least 24 hours in advance and make an appointment. A hostess will meet you, give you a guided tour, and then it will be time to leave. Visitors are not allowed to walk around the lobby or hotel grounds. Golf courses provide wonderful views for high end homes and condos. You can see a row of either condos or Four Seasons hotel units on the ridge in this photo, overlooking the golf course, forest, and the Gulf of Papagayo. I have mixed feelings about master-planned resorts like this, which I will share, of course, during the rest of the photos in this series. Here is another photo showing the Papagayo Golf Course, with the Gulf of Papagayo by in the distance. The project today is extremely environmentally conscious, perhaps in part because of the history I mentioned yesterday of violations in its early development. The new government in the late 1990's decided that despite the violations, the development was too far along to stop, so they changed developers and allowed the project to be developed with strict controls. You can see that much of the peninsula contains dense forest. The golf course is spread out over almost twice the acreage of a typical golf course. The forest here has hundreds of trees of protected species, and every protected tree with a trunk more than two inches (6 cm) in diameter is plotted GPS coordinates GPS and cannot be cut or moved. Natural predators are used for insect control. The golf course has been certified by the Audobon Society as a Cooperative Sanctuary. There are lots of animals that share the peninsula with the resort, and of course that is part of the attraction for visitors. More about that, later. This photo shows the Papagayo Golf Course, with a view cascading down the fairway to the Gulf of Papagayo. There are luxury hotels and resorts around the Gulf. The Costa Rican government selected the Gulf of Papagayo development as a luxury resort area in the early 1990's and awarded a development contract to a company that developed Cancun. After a change in Presidential administrations in the country in 1995, the minister of tourism and 11 other officials were indicted for bribery in connection with the project, and the project was temporarily halted because of violations of environmental and labor laws. I will continue with this story in the days ahead. I will be showing you a series of photos of the Papagayo Peninsula during the next week or two, starting with the photos of the entrance that I have shown during the past three days. To get you oriented, here is a photo of Papagayo from the air. The government fostered the development of this area for upscale tourism, and upscale it is. In the narrow saddle near the end of this peninsula is the Four Seasons Resort. The Arnold Palmer golf course is visible as the lighter patches of green. The Gulf of Papagayo is to the right. Across the Gulf is a Hilton all inclusive resort. There are other resorts tucked away in the area. The newspaper just announced that Papagayo has been selected for the first resort in Latin America by Bulgari, the jewelry company that also owns 3 hotels, in Tokyo, Bali and Milan, with a fourth in London opening next year. The newspaper said that the Bulgari hotel in Papagayo will cost $100 USD to build and will have room rates of up to $4,000 per night. Today is Sunday, so we have new photos posted on our Viva la Voyage travel photo site. This week we return to Bellagio and Lake Como to show photos from the Villa Serbelloni, a retreat for scholars owned by the Rockefeller Foundation. This is a closer view of the statues at the entrance to the Papagayo Peninsula. Each granite figure is bigger than a a car. The progression of four figures is evocative of birth or creation. And creation is a good theme for the Papagayo Peninsula. The project is anchored by a Four Seasons Resort and an Arnold Palmer designed golf course, but when the entire Papagayo project is finished there will be 7 resorts and 3 championship golf courses. More on that later. This week we are showing photos of the Atacama Desert on our Viva la Voyage travel photo site, including the highest altitude geyser field on earth, high in the Andes Mountains in Northern Chile. The trees I showed yesterday are part of the entrance to the Papagayo Peninsula. These statues are part of a huge water feature at the entrance. The guard station is at the right. No one is allowed to drive down this private road to reach the Papagayo Peninsula unless you have a reservation at the hotel or restaurant or live at one of the houses or condos in this master planned development. Note that the road is made of pavers. It is 7 km of paver stones on the roadway to reach the Four Seasons hotel from this entrance. I cannot imagine how much it cost just to pave the roadway. I suspect that you will be able to observe several unusual or unnatural things about the grove of palm trees in this photo. 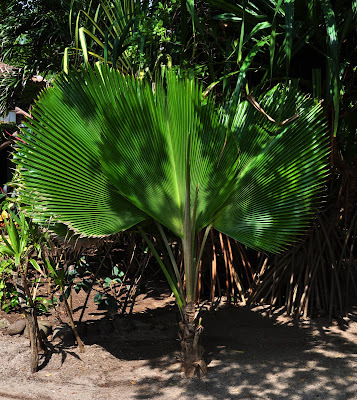 They are uniform in size, height, and they are growing in rows right next to a manicured lawn. These are obviously planted, not growing wild in nature like this. I suspect you may also be able to guess why someone would plant such a dense, dramatic grove of mature palm trees all in the same place. It will all make sense in the coming days, as I am beginning a new series today that I hope you will like. To add perspective to the photo that I showed yesterday, here is a wider shot with Julie on the bedroom balcony of our condo, next to the large balcony/patio off our bedroom and living room. We love the balcony of our condo. We can hear the ocean waves, feel the ocean breeze, and we never tire of watching the sunset over the Pacific ocean. This is the final installment in my series of photos of what is a rather typical walk along Langosta beach. I hope you have found it of interest and I hope it has shared with you a sense of our appreciation for why we enjoy having vacation property in Tamarindo and Playa Langosta. I will show some photos of the Langosta beachfront houses near our condo in the future. But before that I will begin a new series tomorrow of an area that is even more upscale than Playa Langosta. 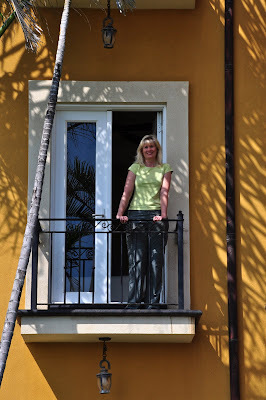 Today is my wife's birthday, so allow me to say happy birthday by showing this photo of her, as she came out on the little "Juliet balcony" of the master bedroom of our condo after my little walk on the beach that I have shown you during the past few weeks. We celebrated Julie's (milestone) birthday a little early by spending 5 days in northern Sonoma County wine country in California with 8 friends over the recent Labor Day holiday. Julie made all the arrangements for the trip, including special wine tastings, lunches and dinners, including a private dinner in the aging room at one of the wineries. Although I have been serious about photography about 40 years longer than she has been, she is now a better photographer than me, as regular readers of her Scottsdale Daily Photo and Viva la Voyage photo blogs are able to attest. I am sure Julie will be showing some photos from our Sonoma wine trip in the future on our Viva la Voyage travel photo site. We enjoy Sonoma County more than neighboring Napa, as it is not as crowded, less traffic, the wine tastings are more relaxed and less touristy, and the wines in the Russian River Valley, Dry Creek Valley, and Alexander Valley are some of our favorites. Upon returning from my walk along the beach that I have shown during the last few weeks, here is the view of our condo building that awaits me from the beachfront gate that divides our condo from the beach. All of the condos on the first two floors are two bedroom units. The third floor are three bedroom penthouse units that have interior stairs to a fourth floor master bedroom suite with a patio for the master bedroom above the main patio/balconies. One of the penthouse units is listed for sale for a little over one million U.S. Dollars. 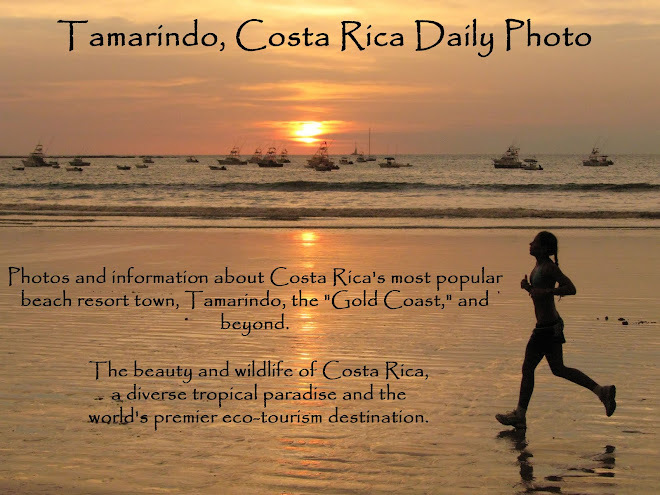 That may raise some eyebrows for prices in a developing country, but Tamarindo is full of foreigners and the housing is marketed primarily to Americans and Canadians. And the prices compare very favorably to the price of condos right on the ocean in California or Hawaii. It is possible to buy condos in Tamarindo in a price range from less than $100,000 or more than $1 million, depending on location (particularly distance the beach) and amenities. Our condo is on the second floor just beyond the pool. We like that location because the view of the ocean is better than the ground floor and we do not have the people hanging around the pool right next to our condo. It is time to head back home. I hope you have found this little walk along Langosta beach of interest. Today's photo shows the house next door to our condo. I took this photo from the beach, looking up at the house. This house has a commanding view of the beach and the ocean. The lot between this house and our condo is the last beachfront lot on Langosta Beach that does not have a house already built on it. I wonder when the woman who owns it will decide to build a house. A comment about September 11: Today is the 10th anniversary of the horror of the 9/11 attack. Costa Rica has a 9/11 Memorial Park with a 9/11 monument on the outskirts of San Jose, where there will be a ceremony today. There were two Costa Ricans who worked in the World Trade Center on 9/11/2001. One was on the way to work when the tragedy struck. The second was on the 11th floor, and she managed to escape before the buildings collapsed. Costa Rica has many ties to the USA, of course. The reduction in travel in the aftermath of 9/11 hurt Costa Rica. In the last 15 years tourism in Costa Rica has increased every year except two, a very small drop off in 2006 and a reduction four times larger in 2002, right after 9/11. We still grieve for the losses suffered on 9/11 and lament the upheaval in the world in the decade that has followed. We should all hope, pray and actively work for peace throughout the world in whatever ways we can. Costa Rica tries to do its part for peace by having abolished its military more than 60 years ago despite the fact that it is located in a troubled area of the world in which its neighbors have had major problems with violence, etc. This is a closer view of the rocky shore that I showed yesterday. This is not sand. It is a giant rock that has ridges from where the waves have carved little valleys in the rock. At this little portion of the beach, I usually walk higher up on the sand, as it is easier than walking across this uneven surface. This week we are showing photos of our favorite villa at Lake Como, Italy, the Villa Balbianello, on our Viva la Voyage travel photo site. It is a delightful place. A little farther down the beach from the scene where I took the photo I posted yesterday is a spot on Langosta Beach were there is a strange rock formation on the shore rather than sand above the volcanic rocks under the water. What looks like clumpy sand on the left of this photo is actually a large rock formation that has been eroded by the crashing waves. I will show a closer photo of it tomorrow. This is a closer look at the three people who were walking along the beach that I showed yesterday. As you can see, this guy is talking on a cell phone while walking next to a companion in a bikini and another young woman. Here is my question: Who is on the other end of his cell phone that he would rather be talking to instead of talking to the two women who are right next to him? Unless these two gals are his sisters, he is either being rude or he's nuts, unless maybe he is calling to make reservations to go out on the sunset sailing cruise or something like that. Here is a photo of Langosta beach, with some young people walking along the beach. Although it looks like this stretch of beach is just sand, surf and trees, there are some beachfront mansions behind the trees along the beach, as I will show in the future. This photo causes me to wonder about something, about which I will pose a question, . . . tomorrow. The trees along Langosta Beach also reveal some nice hammocks to enjoy a nap or read a book while listening to the surf. This hammock is unusual, as it is made of straw and hangs from a tree with walking roots. If the trees between which the hammock is hung "walk" in opposite directions, they might have to make an adjustment to the hammock. We will continue our walk along the beach in the days ahead, but will have some more traditional beach photos. 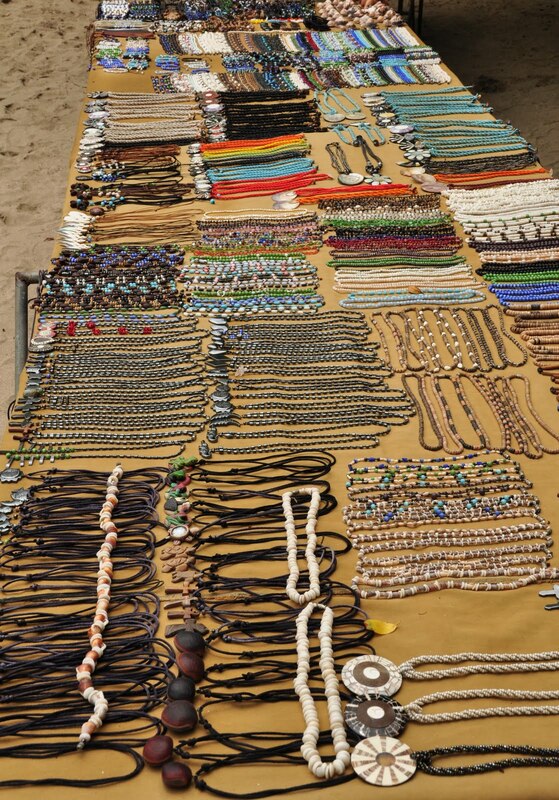 This is a display of some of the jewelry for sale on the beach at the Barcelo Resort, which is on Langosta Beach about 50 yards or meters south of our condo. Local people make very colorful necklaces and bracelets and there are about three or four tables such as this to display the goods. In the main part of Tamarindo, some people will walk along the beach to sell jewelry or pottery to tourists. Fortunately, the vendors are polite and are not aggressive, as some street vendors are in other parts of the world. A quick shake of the head or a wave off with a hand will cause them not to approach tourists who are not interested in buying things. I like the vegetation along Langosta Beach, as there are trees and bushes along the sand so that you can barely see the beachfront houses as you look down the beach. This photo shows what will become a fan palm tree, with dappled light on the sprouting leaves. Tomorrow's photo will be a little unusual for a beach scene. Today is Sunday, so we have new photos on our Viva la Voyage travel photo site. This week we are showing photos of our favorite Villa at Lake Como, the Villa Balbianello. You may have seen it in Casino Royale or another movie. The girl in yesterday's photo got a little more bold in playing with the waves. I think every child who has played at the beach has chased the waves, and had the waves chase them. Langosta Beach is a wonderful place to walk along or enjoy the beach without crowds, as you can see from this photo. I will continue this series of my little walk along Langosta Beach during the days ahead. Several days ago I showed a family under a shade tree on the beach. The father got up to wade in the surf and a girl who appeared to be his daughter came to the water's edge, looking a little tentative. The ocean has universal appeal, especially to children. I will show the girl a moment later, tomorrow. Today's worldwide Daily Photo Theme is "Perspective." OK, I admit it. My photo today is a strange interpretation of that theme. This photo shows what I presume is an unusual perspective: having a view of the ocean while seated on a toilet. 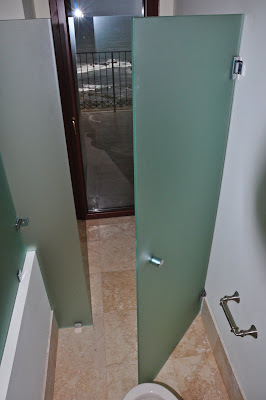 This is a photo from the master bathroom in the penthouse unit in the Crystal Sands condo in Playa Langosta. The building is about half sold, and I visited the building in July, including a penthouse unit that has just been purchased, but the sale had not yet been closed. The master bedroom suite is huge and occupies the top floor of the two-story condo. 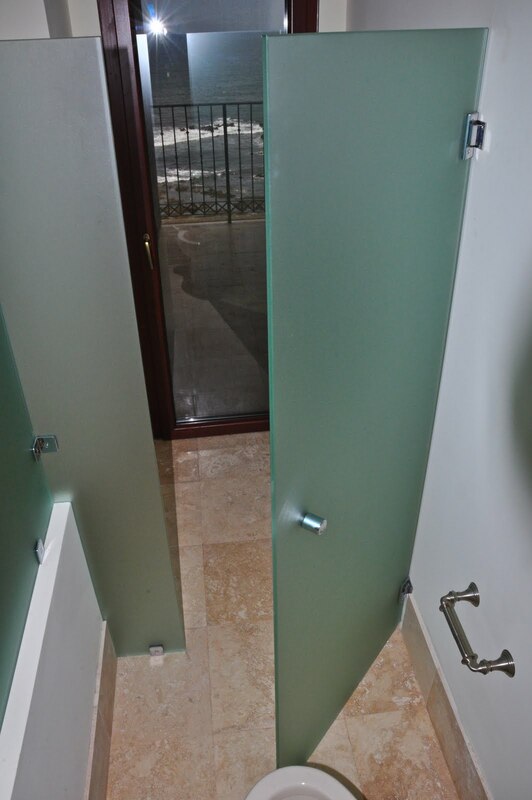 The bathroom has large windows to the full balcony, so that the owners will have a nice view of the ocean while in the shower and, if they leave the frosted glass door open, even while sitting on the toilet. I will show more photos of the Crystal Sands condo building in the future.